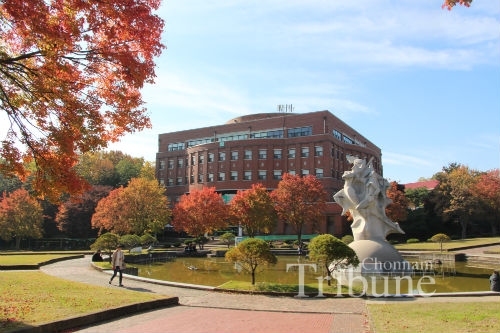 Chonnam National University (CNU) is currently renovating campuses and part of the renovation includes a new digital library. Construction on the new facility is scheduled to begin this year and to be completed by 2019. CNU aims at making the new digital library as a complex cultural space to provide students with an advanced learning environment suitable for digital and mobile society. It may be a necessary step required to become a global research-and-student-oriented university library. It is said that the new digital library is expected to help students appreciate campus life more comfortably and to make up for the weak points of the current library on campus. The Chonnam Tribune examined student satisfaction with the current library and listened to their opinions on the new digital library. The CNU Library (CNUL) that contains the central library and four branch libraries provides support to university members and local residents. As of March 2016, it currently has more than 4,646 seats, 1,681,825 books, and 56,996 journals and periodicals including multimedia resources, the online databases, e-journals and e-Books. In addition to its comprehensive collections, it has more than 246 computers to retrieve its collections and provide access to other organizations’ resources for library users. According to the annual survey report on the actual living and educational conditions of CNU students, released by the Student Life and Counselling Center in May 2016, 53.6 percent of respondents answered that they are satisfied with the books and facilities of the CNUL, and only 12 percent of respondents said that they were “dissatisfied” or “very dissatisfied” with them. Overall student satisfaction with the library has slightly improved when compared to the previous year. According to the announcement about the new library construction, the digital library provides students with many spaces for group projects, free mobile internet access, and a facility for relaxation. Students interviewed said that the news was delightful and expressed their expectations for it. Most classes at CNU have team projects as part of the examination, but many students have constantly complained about lack of the rooms for group projects. Ko Young-joon (Sophomore, Faculty of Business Administration) said, “I considered a sufficient space for team projects as one of grandest advantages of the new digital library. Because I have a lot of team projects due to my major. I usually have hard time using spaces on the campus because they are not very competitive to make a reservation. It is really hard to find school facilities like a student lounge so I have to go to a café nearby campus for team work.” Many professors expect students to refer to various kinds of books to make their assignments’ quality much higher. Even some professors give an extra credit for citing some books. As the response of this trend, more and more students are using their personal computers in the library to do their assignments. However, at the central library, there are three or four seats for laptop users in the hallways but there are not enough for the students’ needs. A lot of students requested for some places to use their laptops. Heo Seong-min (Sophomore, Department of Public Administration) expects that a space for ICT utilization and a notebook zone will help students to do work on a school project more easily. Students hope that they can use more convenient services from the digital library immediately. However, there are some complaints about the location of the new digital library. It would be a good place for students but it would be better to build it in a different location, not behind Yongbonggwan in chorus. Ahn Jong-won (Sophomore, School of Mechanical Systems Engineering) said that the main library is densely packed in the same place, so he has trouble visiting the library when he does not have enough time because of the distance. Before the completion of the new building construction, most students on the register now will graduate. Therefore, many of them welcome the digital library construction but they are disappointed about the date of completion because they will not be able to use it. Whereas the current library primarily focused on adding to library collections, the role has become more complex in a digital and information age. Many students have felt uncomfortable to use the current library for various reasons including lack of spaces for group work and studying. They look forward to the new digital library because they think it will supplement the faults of the current library. Furthermore, it is a multifunctional library adapting in rapidly changing digital environment. Nowadays, integrated information systems are developing every day and students need to acquire top-notch knowledge in the information-oriented society. The new digital library will be a very useful space for students’ school life. Ultimately, CNU students expect that both the current library and the new digital library will satisfy their needs.